AS I LAY DYING, photo credit: Ty Watkins. The Grammy-nominated rock group AS I LAY DYING have premiered a lyric video for their new song “Cauterize.” This news comes as the San Diego based rock group is about to head on the road for the Rockstar Mayhem Festival. Fans can expect to see the band–renowned for delivering explosive live performances–all summer long on the Mayhem Festival alongside select U.S. solo dates (see full itinerary below). Watch the clip for “Cauterize” here: http://www.metalblade.com/asilaydying/. 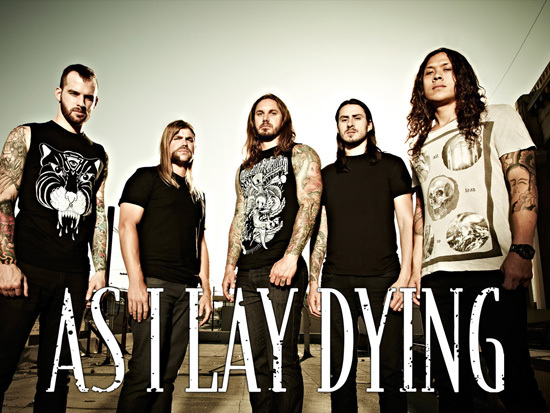 AS I LAY DYING will release their new album AWAKENED, September 25 on Metal Blade. For the new album, the band–NICK HIPA (guitar), TIM LAMBESIS (vocals), JORDAN MANCINO (drums), PHIL SGROSSO (guitar) and JOSH GILBERT (bass)—teamed with renowned rock producer Bill Stevenson, who’s also the drummer for Descendents (and has played with Black Flag); and mixer Colin Richardson at the Blasting Room in Fort Collins, CO.
AWAKENED marks the follow-up the Decas EP (2011) which reached #2 on the iTunes Rock Chart. The group’s last LP, 2010′s immensely successful The Powerless Rise debuted on the Billboard Top 200 at #10. The Powerless Rise also reached #2 on Billboard’s Independent Albums Chart and #3 on Billboard’s Hard Music Albums Chart.